I took the weekend off from stitching and made some charms for a handmade charm swap. I happened to have quite a bit of polymer clay sitting around that I hadn't touched in ages ... so I thought I would put it to use making charms. They weren't very difficult to make. The hardest part was conditioning the clay for use. After the clay was ready to use, I rolled it into small ball shapes. I flattened the balls into disc shapes, and used some buttons and rubber stamps to press images into the clay. After baking, I used acrylic paints to accent the embossed images and sanded them for an aged appearance. I finished them with a glossy coat of varnish and added jump rings for attaching to a charm bracelet. I can't wait to see all of the charm returns from the swap! These are really cool. 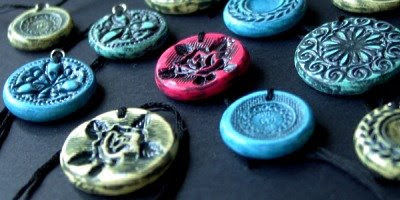 Have you thought about making some to sell on Etsy? I bet they would go pretty quick.